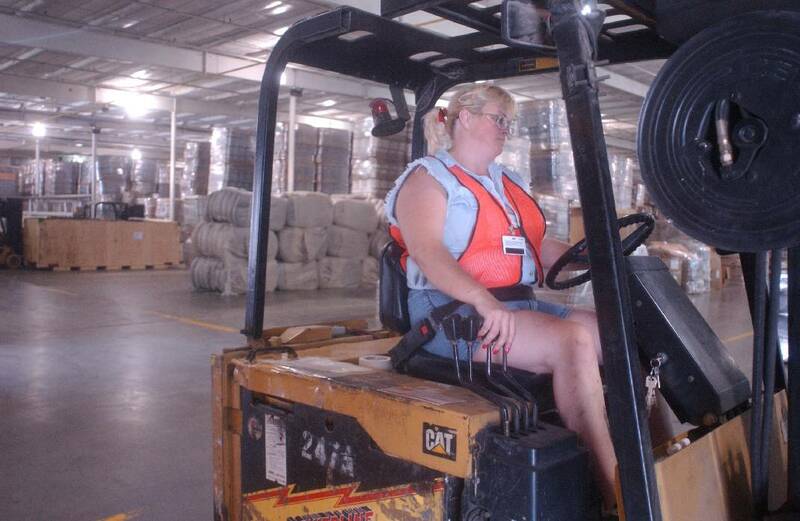 Melissa Kernea prepares to pick up a load of yarn off of a conveyor belt at Mohawk Industries, Inc. in Dalton where she has worked for five years. 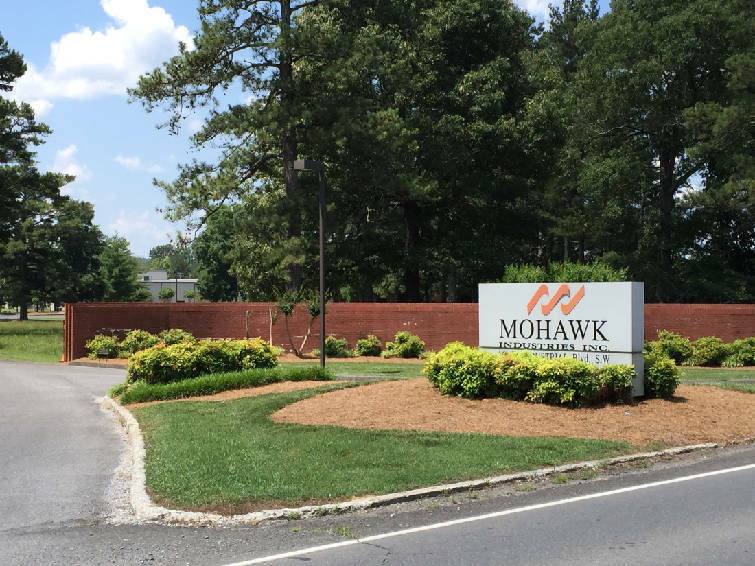 Calhoun, Ga.-based Mohawk Industries is the largest flooring manufacturer in the world. Mohawk Industries Inc. boosted profits and sales to an all-time record this spring, encouraging the floorcovering maker to plan more than $600 million of capital investments this year to continue to grow the company. The Calhoun, Ga.-based carpet, tile and laminate manufacturer said Thursday its net income in the second quarter rose 35 percent from a year ago to $255.2 million, or $3.42 per share, on sales of $2.31 billion. When adjusted for one-time gains and costs, net income in the period came to $3.47 per share. The quarterly profits surpassed Wall Street expectations. The average estimate of four analysts surveyed by Zacks Investment Research was for earnings of $3.36 per share in the second quarter. For the current quarter ending in October, Mohawk Industries expects its per-share earnings to range from $3.40 to $3.49. Analysts surveyed by Zacks had forecast adjusted earnings per share of $3.37. "We delivered our highest sales for any quarter in the company's history, and our earnings per share set an all-time record for the company, marking the ninth consecutive quarter that Mohawk has delivered a year over year record quarterly adjusted earnings per share," Mohawk CEO Jeffrey Lorberbaum said in a statement. "Our innovations in products and processes, investments in efficiencies and integration of our acquisitions enhanced our performance during the quarter and provide a foundation for long-term growth." Mohawk has benefited from $2 billion of acquisitions and investments over the past three years, primarily to expand the one-time exclusive carpet manufacturer into a range of hard surface flooring. For the first six months of the year, Mohawk profits were up 33 percent from last year and Lorberbaum said the improvement in sales and profit margins should continue through the balance of 2016. "Our current booking trends have improved, and we anticipate that third quarter sales growth will be higher on a local basis," he said. "We expect continued margin expansion in all of our segments due to process improvements, operational innovations and greater efficiencies." Mohawk is preparing to startup production of its $180 million ceramic plant in Dickson County, Tenn., which Lorberbaum said "is ahead of schedule with the last line becoming operational in the third quarter. "We are manufacturing higher value products at the facility, including 48-inch wood planks and color body porcelain tiles," he said. The company is planning additional expansion projects for luxury vinyl tile and premium laminate in the U.S. and Europe, ceramic tile in Mexico, Europe and Russia and continuum polyester carpet, engineered wood and utility mats in the United States. "By the end of next year, we will double our U.S. LVT capacity and enhance our capabilities in this fast growing category," Lorberbaum said. "We are optimistic about our future performance as a result of our ongoing investments in people, products and assets. The improved results have helped boost shares of Mohawk this year, although shares are still slightly below the all-time peak reached last August. Mohawk Industries shares have risen nearly 10 percent since the beginning of the year, outpacing the overall gain in the Standard & Poor's 500 index of 6 percent this year.